By using modern tools from the web development industry, I’m developing fast and responsive WordPress themes, tested across different web browsers to bring the same user experience across different devices to your customers. If you use Divi, Enfold or some other theme, I can also work on them and adapt them to your business needs. After working for many years in WordPress development world, I know how that platform works and what is capable of doing. By utilizing plugins API and best coding practices, I’m building custom admin pages, custom database tables, frontend user forms and everything other that comes to your mind. WooCommerce is built in a way so that pretty much everything can be modified. If you need to change how your webshop looks, the way how checkout process works or anything else, I can help you achieve that. I am an author of a WooCommerce add-on released on the WordPress plugin directory and which has over 2000 active installations. In case you plan to publish your plugin in WP plugin directory I can also help you do that. A fast website is good for SEO, and it saves your customers time. Front end or back end, everything can be optimized. I can help you reach out that green light on the Google PageSpeed Insights. Having a secure and 24/7 online website is the most important thing. I can keep an eye on your website for a few bucks each month while you will have more time to enjoy other things. After working hard for eight hours a day, I love to move away from the computer screen, go outside and drive a mountain bicycle or do some stuff around the house. I also like to travel and attend IT conferences. You will probably see me on next WordCamp Europe where I will volunteer. If you see me feel free to pull me for a sleeve and say “Hi”. Until then let’s do some business together. Network Of Corporate Academies – Custom CRM solution. Front-end and back-end development. Exactly the expected expertise, clear and open-minded communication even since the estimate phase, short response time. Easy to work with. Quality work, responsive, great communication. Listen - this guy just helped me out in a few hours for a plugin that I struggled with and had a deadline with. He is definitely able to handle stress. If you tell him to do something he does it exactly the way you ask. Thanks so much. Ivan wrote a clean and elegant code. He also delivered the work fast. All perfect. 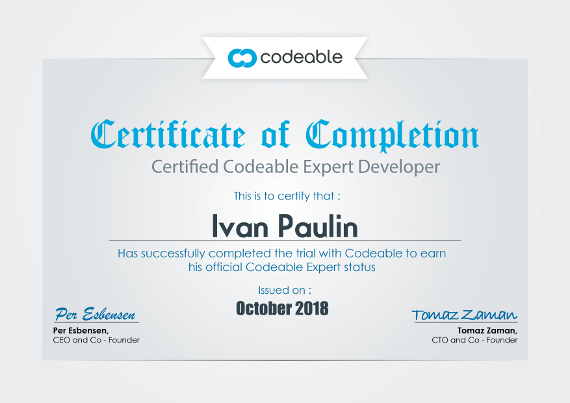 Great work and communication from Ivan. Always five stars. Would want him in my programming room 24/7. Extremely patient and definitely goes the extra mile. Always a pleasure to work with Paulin.!!! Really great to work with. Did a great job! This is the second job that he had had to do for me in a very short time period over the weekend. He was quick and knew exactly how to solve the issue.